I recently replaced my stock springs with H&R Sports. I also removed the 2-dot pads in the back at the same time. The result was a way-low rear-end that felt like it had no travel whatsoever in the springs. Very harsh. And goofy negative camber. The other night I took the springs back off, and put the 2-dot pads back on. At the same time, I made sure my Koni Yellows were adjusted alike, at 50% rebound. Now the height and camber look much improved, but the ride is still very harsh, like it's bottoming out all over the place. 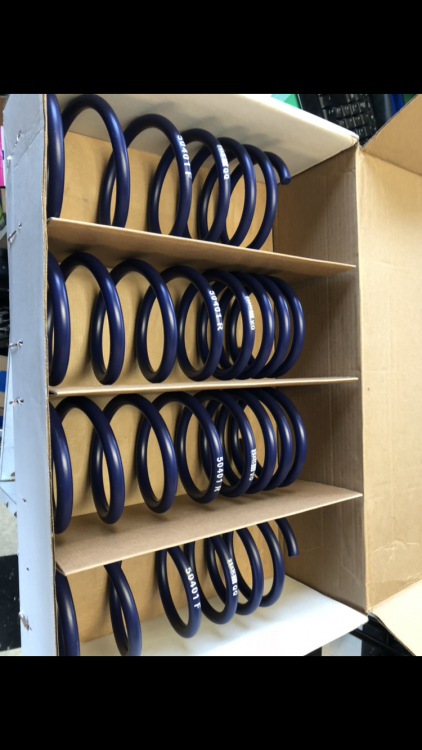 Should the springs be that compressed? Are those just dead coils? Or do I have them in upside down or something? If I'm just being a wimp with my harshness complaints, that's fine. I'd just like to be reassured that all is right with the (rear suspension) world. There are different thicknesses of spring pads, but you should always be running spring pads. This is likely why it looked wrong and felt terrible. And yep, put your dampers on their softest setting and incrementally firm-up to taste. Maybe also take a photo of your car so we can gauge the overall ride height. I’ve never felt like I was bottoming out anything with my car with a full H&R setup... but I haven’t gone full ‘Dukes’ with it. 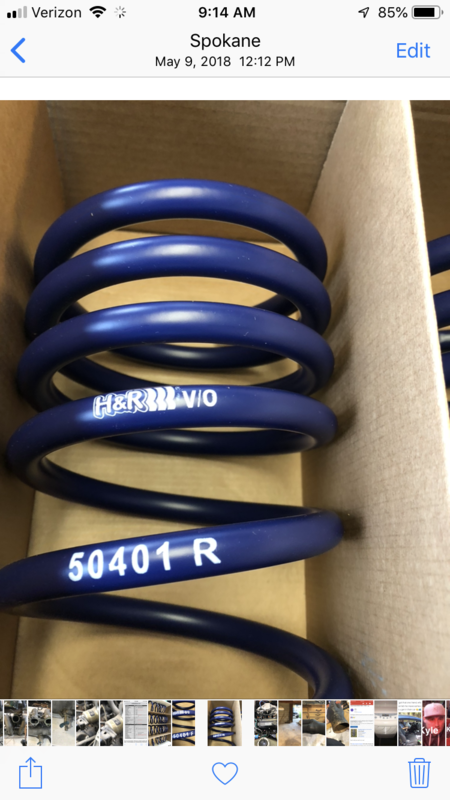 I recently replace my stock springs in my 73 tii with H&R Sport springs. Attached is photo of my rear springs. 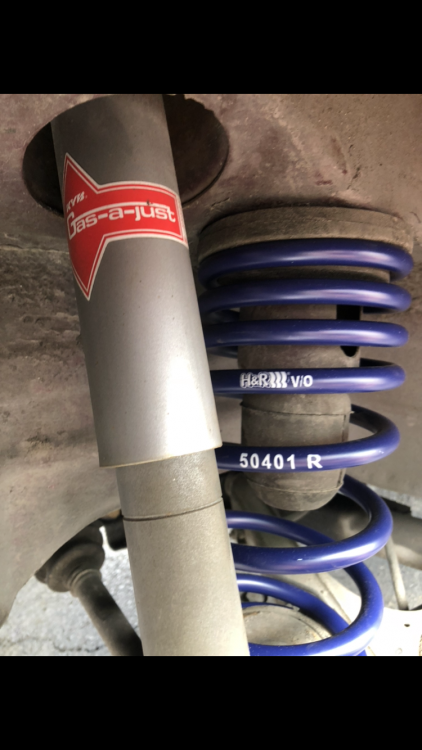 I have Bilstein HD stocks. I don't notice any harshness or bottoming in the ride. My rear is about 3/8" higher than the front (measured below the rocker panel). Thanks for the feedback and suggestions, all. I'll dial down the damping as suggested. In the meantime, I'll get a photo of the ride height for reference. Thanks for the photo above, too. It makes me feel much better. To clarify the no-pads state I mentioned: I had removed only the upper 2-Dot pads, but put vinyl tubing on the first couple top coils in its place. I left the bottom perch pads in place. 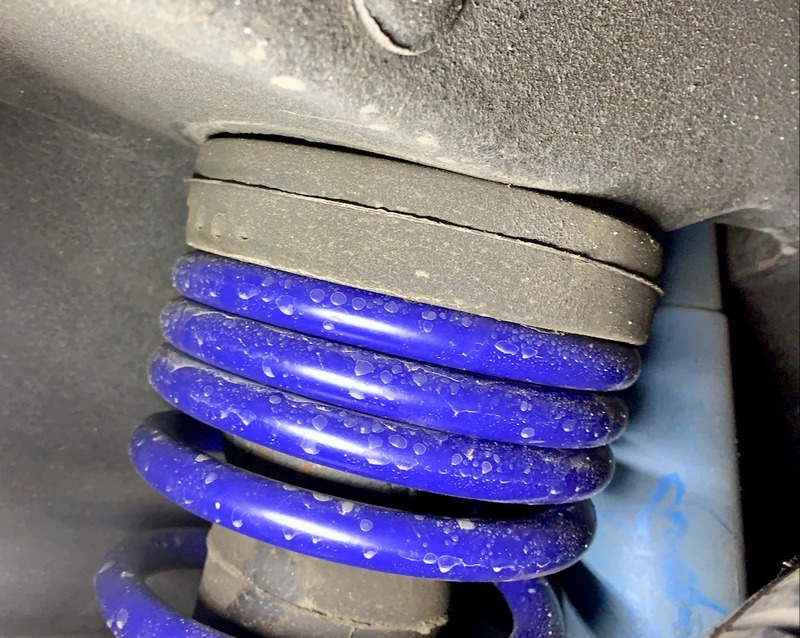 Clear plastic tubing doesn't = spring pads...they come in different thicknesses only to govern ride height, but are a necessary part of the suspension, as you found out when you deleted 'em. If you wanted a lower ride in the rear, use one dot pads. 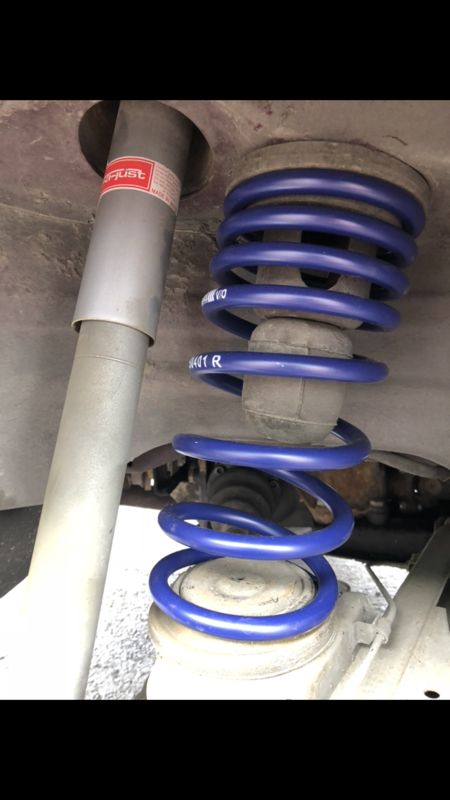 Are you sure that those aren't front springs? The V/O I think stands for Vorn. Vorn = "Front"
IIRC the rear should be marked "H/A" for Heck. Heck = "Rear"
I was thinkin the same but looking at some H&R markings it seems that's not the case. It seems that the letters X/Y after H/R have some other meaning. Maybe we should see how the ride height actually looks from the side of the car. 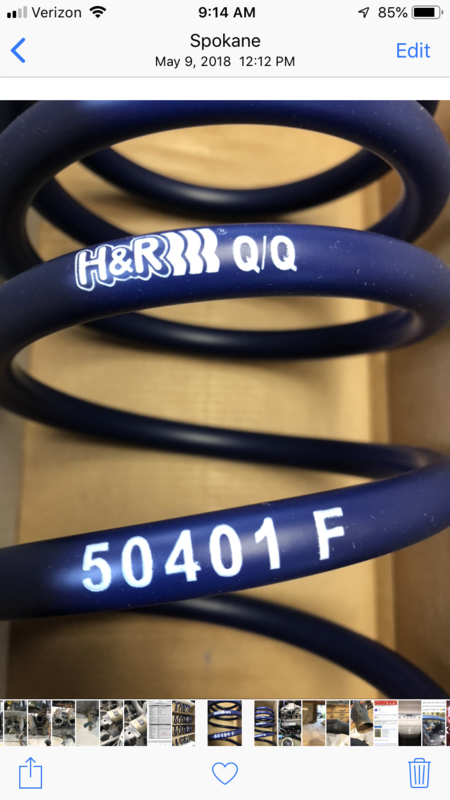 Yeah, if I have the fronts and backs switched, then H&R needs some serious help localizing their product labeling. The springs I put on the front are marked with a big ol' "F" and the rear have an "R" of similar magnitude. That seems to be a constant across applications, whereas the letters next to the H&R logo (e.g. "V/O") are not. Thanks for the ideas, though. I'll get a profile shot of the car tonight, hopefully. Something tasteful. Thanks again. The springs I put on the front are marked with a big ol' "F" and the rear have an "R" of similar magnitude. That seems to be a constant across applications, whereas the letters next to the H&R logo (e.g. "V/O") are not. Yup, mine have the F and R markings, as well as U/W and L/S. Same 50401 number. The right side looks a little higher than the left, but I expect that's the sloped driveway or something. I do like the way the height looks! And just pulling it out of the garage for two minutes hooked a passerby. It's a real conversation starter. The general consensus among you pros seems to be don't be concerned about how compressed the tops of the springs are. Is that right? correct. they are progressive. they are supposed to do that.